Basilica of St. Peter and tombs of the Popes. We provide private and small-group tours of Rome and the Vatican. Top-rated tours guides will take you on a memorable tour in any place in Rome and the surroundings. We take special care of our clients. No lines, no large noisy groups. Our itineraries are tailored on your vacation needs! Private guided tour of the Vatican Museums, the Sistine Chapel and the Basilica of St. Peter. No lines, customized itinerary. Visit the Colosseum and the highlights of Ancient Rome on this top-rated private tour. You will see the Forum, the Emperors' House and much more. Visit the highlights of Rome in a one-full-day memorable tour: Colosseum, Vatican, Forum, Sistine Chapel, Trevi Fountain, Pantheon & Piazza Navona. If you've only seen Rome from above, you may have missed half of the experience! There is a whole city underground waiting to be explored. Visit the subterraneans of Rome with our excellent guides. Catacombs can be added as option. Throw a coin in the Trevi Fountain and visit the Pantheon, the Spanish Steps, Navona Square, the Temple of Hadrian, the Government Square, Campo de' Fiori and much more on this 3 hours tour. Visit one of Rome's most charming areas: medieval lanes, restaurants, narrow alleys, little squares and churches to explore. Private guided tour of the Borghese Museum and Gardens. It is one of the world’s most beautiful galleries and includes artworks by Bernini, Caravaggio, Raphael, Titian and much more. Learn about the art and life of the greatest XVII century painter in Europe, Caravaggio. This private guided tour is led by a university graduated expert. Private guided tour of the remains of Nero's golden house, the Domus Aurea. you will be fascinated by its rooms, paintings and history. Tivoli is an amazing place that is truly worth visiting but gets overshadowed by more famous attractions in the nearby Rome. in Tivoli you will see Villa D'Este with spectacular gardens & Hadrian's Villa. Ostia is one of the largest excavated Ancient cities in the world. We will visit the original temples, restaurants, mills, laundries, warehouses, baths and the famous theatre. Florence is only 1,5 hours away from Rome by train. This private tour of the highlights of the city will make your experience in Florence memorable! Visit the largest excavated Ancient City in the world and second most visited site in Italy, protected by UNESCO! Less famous but as beautiful and interesting as its twin sister Pompeii, Herculaneum is an Ancient town that you must visit during your stay in Italy. 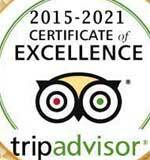 Take a top-rated guided tour with us. 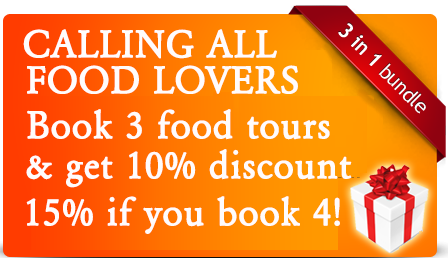 Private or small Group (max 15 people) tour of the best delis and most traditional restaurants in Rome. You will eat & drink a lot of great food and wine as well as visiting some interesting sites of the city. Most of Italy’s delicatessen were invented in Naples, the capital of Italian food, where Pizza Margherita, Spaghetti, Babà and Sfogliatelle were born, only to mention a few. 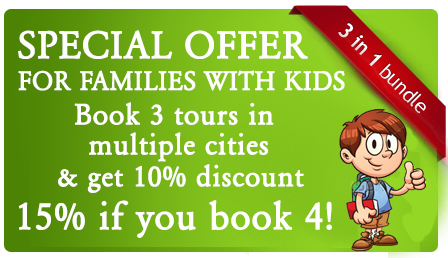 On this tour you will taste them all as well as being guided in a beautiful sightseeing through the city. Eat, drink and sightsee in Venice with our local expert guide that will make you taste and visit the best of this beautiful city! Take a memorable guided tour to Rome from your cruise ship in Civitavecchia in a new comfortable private vehicle. No lines, no large noisy cruise groups. Guided excursion from the Port of Naples to Pompeii, Amalfi, Sorrento and Positano. Great guide, excellent driver, comfortable vehicle and breathtaking sightseeing! Comfortable cruise excursion in private minivan from the port of Livorno to the leaning tower of Pisa and Florence. Our driver will pick you up at the ship and take you on a memorable journey through the beautiful Tuscan hills. We provide you the top guides in Rome; they are all licensed and speak excellent English. You will save time and money by following our guides' steps and suggestions. With more than 500 online genuine reviews from our previous guests you can definetely trust us! Why take a group tour when our private tours are more informative, entertaining and time-saving with our no-lines policy! In the Vatican with a family from Thailand. Inside an Ancient restaurant in Ostia Antica. In front of the Basilica of St. Peter. In front of the Temple of Saturn. We are a team of local tour guides that are among the best of Italy. Hundreds of online reviews are a proof of our great work! We aim to provide you top-quality services and memorable experiences in our beautiful city. We got great reviews online...read what our previous guests say about our tours and our guides.